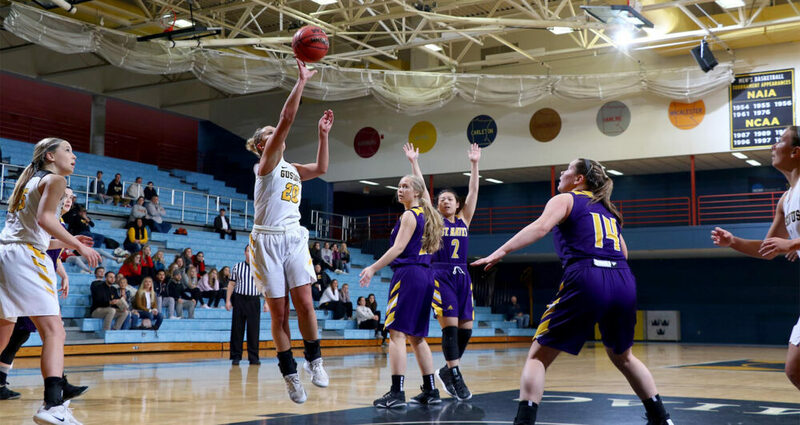 SAINT PETER, Minn. – The Gustavus women’s basketball team Saturday clinched a MIAC postseason tournament berth with a 69-56 win over St. Catherine. The playoff berth is the 19th consecutive by Gustavus – the most in MIAC women’s basketball history – as the Gusties improve to 13-10 overall and 10-6 in the MIAC. Since the initiation of the MIAC tournament in 2001, no team in the MIAC has earned a trip to the league playoffs every year except for Gustavus. The game started back and forth with four lead changes in the first quarter, resulting in a 15-14 St. Kate’s lead after 10 minutes. The Wildcats increased their lead to five points halfway through the second quarter, but the Gusties ended the half on a 9-2 run to take a 30-28 advantage into the locker room at halftime. Gustavus inched its lead up to 41-35 with four minutes left in the third quarter before the Wildcats responded with 11 unanswered points over the next 2:40 to gain a 46-41 lead. A free throw and consecutive three-pointers by Justine Lee (Sr., Dawson, Minn.) and Gabby Bowlin (So., Winona, Minn.) gave the Gusties a 48-46 lead to finish the third quarter and they never relinquished the lead the rest of the way. The Black and Gold outscored the visitors 21-10 in the fourth to complete the 13-point victory. Gustavus shot a blistering 76.2 percent (16-21) in the second half and 51.8 percent in the game – its second highest mark of the season. The Gusties also out-rebounded the Wildcats 32-24. Lee posted 20 points on 8-of-14 shooting and is now 20 shy of 1,000 career points. Paige Richert (So., Comfrey, Minn.) added 16 points and five rebounds, while Kendall Thompson (Sr., Eden Prairie, Minn.) contributed 14 points and seven boards. Ava Gonsorowski (So., Esko, Minn.) finished with a career-high 10 assists, marking the most helpers by a Gustie since Mikayla Miller totaled 10 on Feb. 23, 2016. Gustavus next plays at Bethel at 7 p.m. Wednesday.